Leave a Comment on Love Wine? Discover the True Wine Cooler + Get a $100 LCBO Gift Card! True’s dual-zone wine storage system has been designed to preserve your favorite vintage. Two independent zones allow for complete flexibility with a temperature range from 35°F to 65°F. Equipped with vibration-dampening racks that cradle up to 45 bottles ensures the ideal environment for your collection. Patented trilumina™ LED lighting gently illuminates your wine and allows you to choose from white, amber, or blue. • Industry exclusive 300 series stainless steel interior and exterior. • Zero-clearance hinging allows for integrated installation. • Patented trilumina LED lighting gently illuminates your wine and allows you to choose from white, amber, or blue with the push of a button. • Low-E, double pane, UV tinted glass. • True Precision ControlTM with steel touch technology and readout provides digital accuracy within 1 degree. 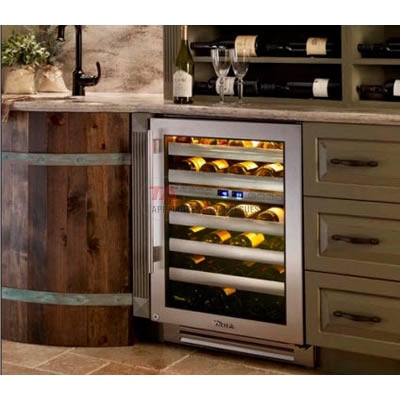 • 5 glide out wine racks and 1 floor cradle that accommodates a total of 45 bottles. • 2 independent zones that can be adjusted from 35°F (1.7°C) to 65°F (18.3°C). • TrueFlex™ shelving system that allows convertability of either zone to a beverage center or refrigerator.